After a full two weeks out on the road, it's good to be home. According to our trusty Garmin 360 GPS, we logged 2,446 miles; averaged 59.1 MPH while moving; drove for 41 hours, 11 minutes, were stopped for 11 hours and 56 minutes (some horrible construction in Wisconsin and Indiana); which translates into an overall average speed of 45.8 MPH. Interestingly, our moving average speed on the way to NY was barely 55 MPH. We hit almost all our construction delays going east; which meant that if I could calculate our return average speed, it should be a good bit higher. Call me a geek, but I find this interesting. 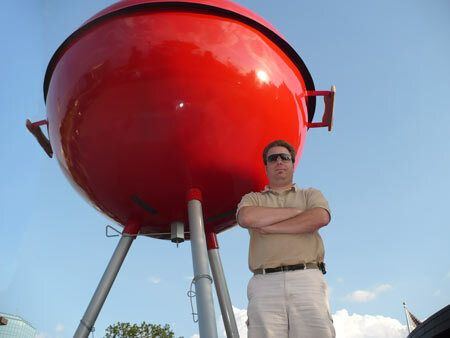 Standing in front of what could be the world's largest Weber Grill at the Weber Grill restaurant in Schaumburg, IL. Road trips aren't nearly as much fun as the used to be. Between construction, traffic and probably age (mine), slogging my way down the highway for 8 hours a day holds a lot less appeal than it did 10 years ago. The thing I found most aggravating was roads that were completely rebuilt from the ground up only a few years ago are now being torn up again for repairs. Here's to you, PA! Sundays are a much better day to drive than Fridays; Saturdays are better than either. We drove from Cleveland to Chicago on a Saturday and we made some time! Traffic was light, and none of the construction zones were active. I will use this information to my advantage in the future. Avoid Fridays at all costs. Two weeks is a long time to be gone. Call me crazy, but I would have rather had a single week off. Perhaps 10 days. By then I missed my bed, my routine, and my backyard. It was fun to see friends, but I wish it could have been more efficient. I need alone time. I already knew this, but it was reinforced during the trip. If I don't get sufficient alone time, I get cranky. Vacation was tough because we were always staying with relatives (which meant we were invading their space), and I was surrounded by my family. I love my family, but I need time to be alone with my thoughts. Regularly. As in daily. I think the best day of the trip was the day I had lunch with my friend Jamie, after which I went back to the lake, took a walk, sat on a bench and just thought. By myself. I felt like a LiOn battery being recharged. I love what I do. Again, I knew this before I left, but it was again reinforced. By about day 10, I found myself sitting with my laptop researching servers, network topologies, piano mics and other techie things. I just can't stand to be away from the action for that long. I know it's healthy to unplug for a while, but I need to do it in shorter bursts. I'm a creature of habit. Another paradox. In my work, I'm a change agent. I'm constantly taking things apart, changing them and making them better. I am always asking if there is a better way to do something. Change is my middle name. At the same time, I eat the same thing for breakfast every day. I have a strikingly consistent morning routine. I like things in the places I put them. Living out of a suitcase bugs me. Perhaps it's because I've already made my system as efficient as it can be, and thus it doesn't need change. I have a good team, and good systems at Upper Room. Even on vacation, my cell phone never turns off. While I took my time off on weeks that we were supposed to have outdoor worship (and theoretically, no tech needs), for the first time in 7 years, outdoor worship was moved indoors. Though I wasn't there, my team handled it well. I did field a few tech-support calls from my presentation tech, and I was able to solve the problem by logging in remotely (since I planned for that possibility). Still, my time off was not consumed by making sure things were happening back at the ranch. I'm one step closer to working myself out of a job. For me, home is where God calls me. When finally escaped Wisconsin Sunday (it's a big stinkin' state! ), I told my wife that last summer, I never would have guessed I would be so anxious to get to back to Minnesota. I've lived in four metro areas in my life (well, actually three, one of them twice), and during each season, I was fully invested in that place. It was my home. But when the time came to leave, I felt no regret, and became almost immediately anchored to my new home. I think this is a protection mechanism from God, a true fulfillment of Psalm 37:4—God giving me the desires of my heart (He puts the desires there...). Well, that's what I did on my summer vacation. I'm glad we went, and I'm glad we're back. I can't wait to get back to work tomorrow. We have some very exciting things coming up with Upper Room over the next few months. Life-changing big things. Stuff I can't talk about just yet—but I will as soon as I can. God is doing a great work in our midst and I'm blessed to be a part of it. More techie stuff to come… I promise!